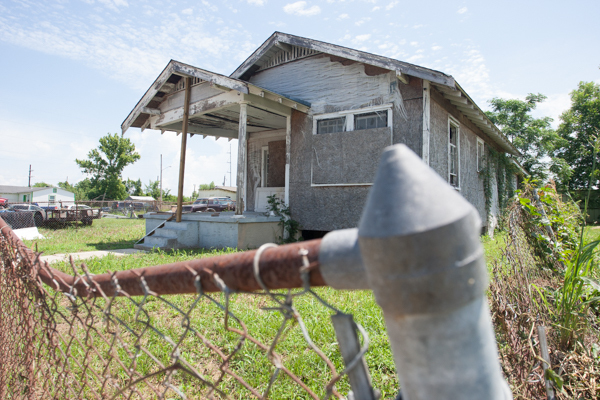 Even 10 years after Hurricane Katrina hit the Gulf Coast, evidence of the destruction is still visible throughout the area! 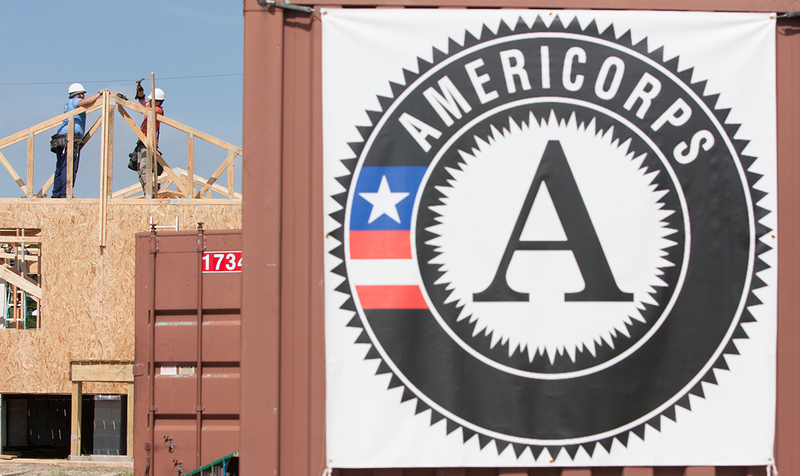 In the ongoing effort to help the area recover, Habitat for Humanity AmeriCorps members are building 10 new houses in a New Orleans neighborhood during their 10 day annual Build-A-Thon blitz build. 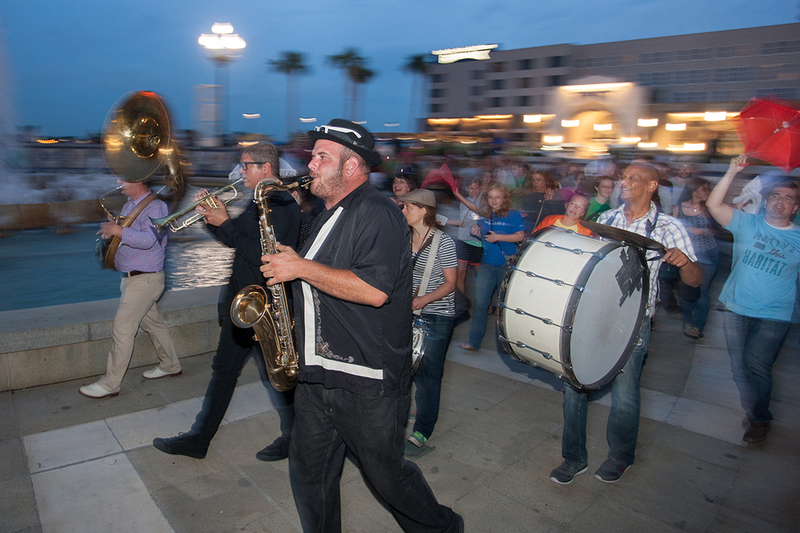 Habitat for Humanity kicked off its annual AmeriCorps Build-A-Thon this week in New Orleans with an opening ceremony which included a jazz band and a traditional “Second Line” procession. 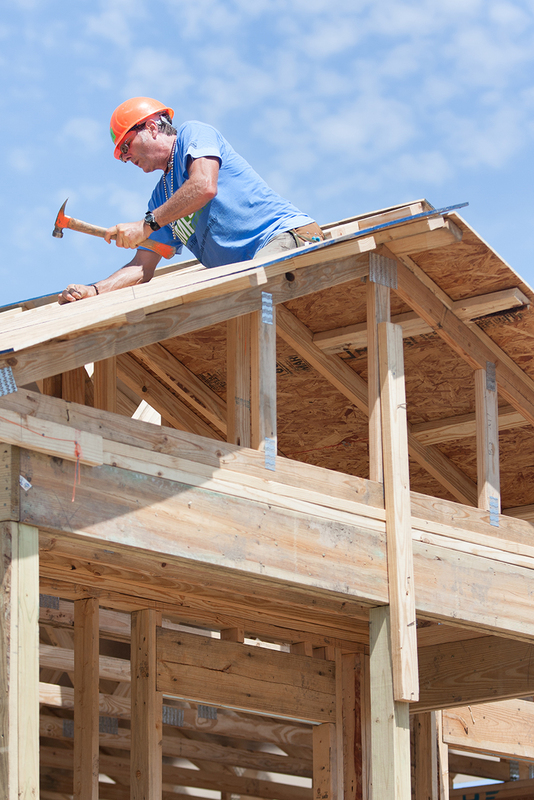 Over 600 volunteers will be building 10 houses during the two week event. 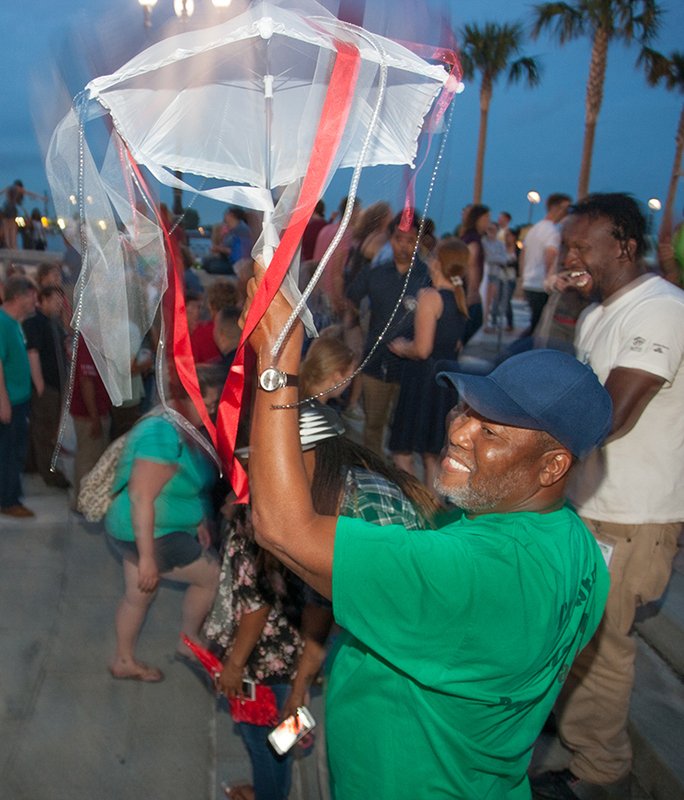 I recently had the pleasure of working behind the scenes of the National Press Photographers Association (NPPA)’s Best of Photojournalism (BOP) 2014 Contest Award Show & Education Festival in West Palm Beach, FL. My wife Angel & I spent two long days hanging the show in the Palm Beach Photographic Centre Museum. Needless to say, the images were amazing! 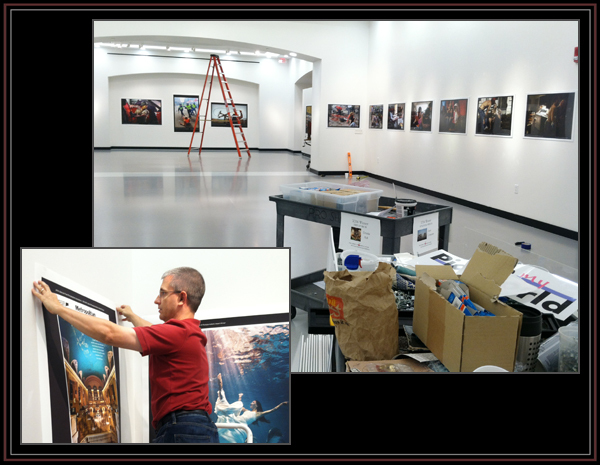 Me (Gregg Pachkowski) hanging an image for the Best of Photojournalism 2014 Contest “Best in Show” exhibit at the Palm Beach Photographic Centre Museum in West Palm Beach, Fla. Photos © Angel Adams Pachkowski. 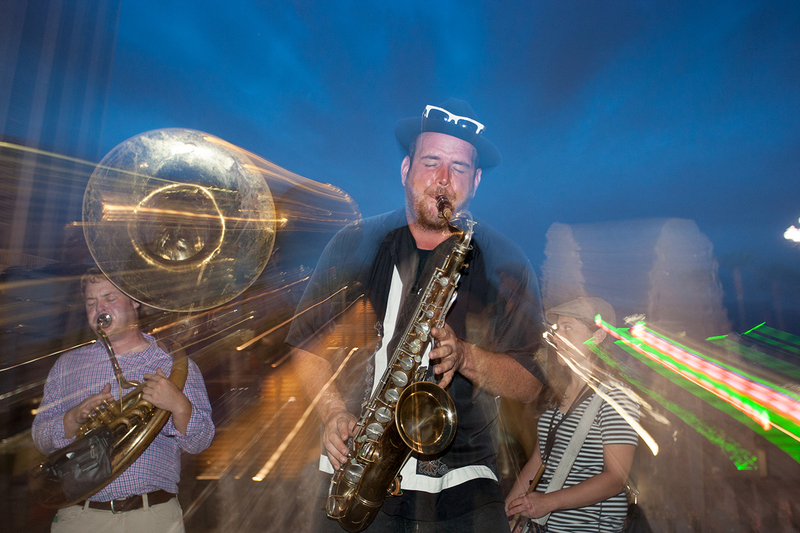 Adding to the whole experience was hearing the personal stories of the BOP winners. In particular, the stories told by Miami Herald photojournalist Al Diaz and Boston Globe photojournalist John Tlumacki were truly inspirational! Almost everyone has seen Al Diaz’ now famous “Breath of Life” photo as it made news around the world. While I recognized it as a powerful image and a great example of the “decisive moment”, I didn’t know the story behind the photo until hearing Al speak at this NPPA event. As Al explained, he was one of the first people on the roadside scene of a 5-month old infant who wasn’t breathing. Instead of immediately picking up his camera, Diaz sprung into action in the rescue effort. It was only after qualified first responders had arrived on the scene did he go for his cameras. Of course, Diaz thought that he had missed the most dramatic images, but he was content photographing the post rescue. As Al was shooting, the baby unexpectedly stopped breathing a second time. These are the images that are now iconic. Diaz was a human-being first and a photojournalist second. 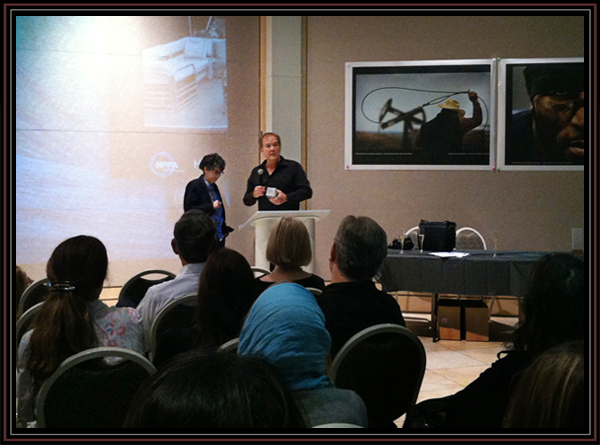 And for this, he was chosen to receive the 2014 NPPA Humanitarian Award. Similarly, John Tlumacki shared the dilemma that many photojournalists struggle with… “Do I or don’t I photograph?” John faced this very question as he was on the scene of the Boston Marathon bombing. He only continued photographing knowing that there were dozens of first responders already on hand. 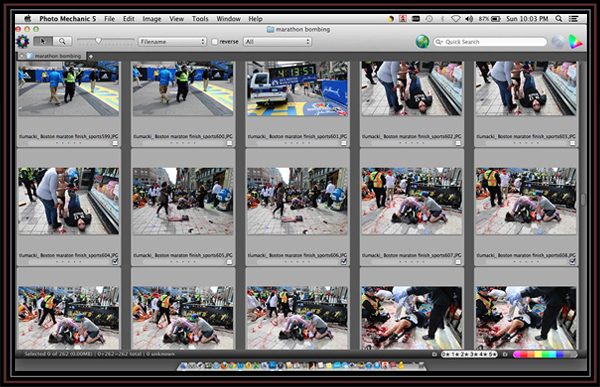 John Tlumacki’s contact sheet from the Boston Bombing. In fact, John said that he felt so bad in the days that followed that he contacted 17-year-old Sydney Corcoran and her mother, Celeste (who lost both of her legs) to apologize. To his surprise, not only were they happy to meet him, but they were grateful that he captured those images that showed the world the horror of that day and what terrorism does. After that first meeting, Tlumacki went on to document their recovery over the next year… and a life-long friendship was forged. For his portfolio of award winning images (including his Boston Bombing coverage), Tlumacki was named the 2014 NPPA Photojournalist of the Year (Larger Markets). NPPA Vice President Scott Mc Kiernan introduces San Francisco Chronicle Deputy Director of Photography Nicole Frugé during the awards ceremony. 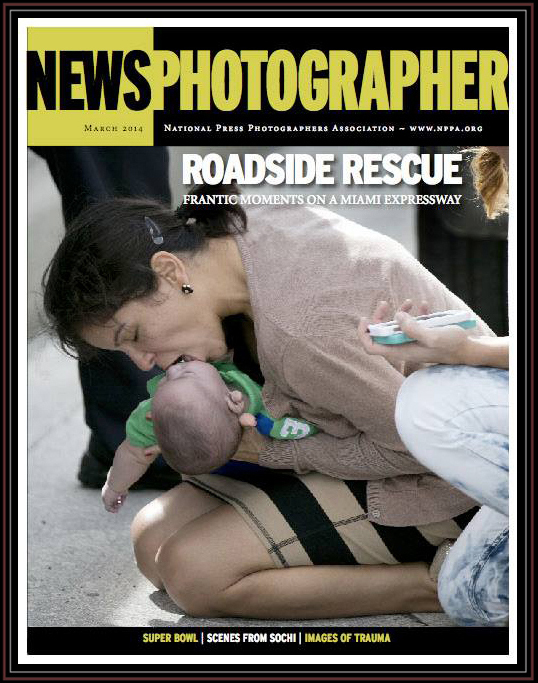 Frugé accepted the 2014 NPPA BOP Newspaper Picture Editors of the Year (Team) award. The movie “Anchorman 2” starring Will Ferrell was just released. 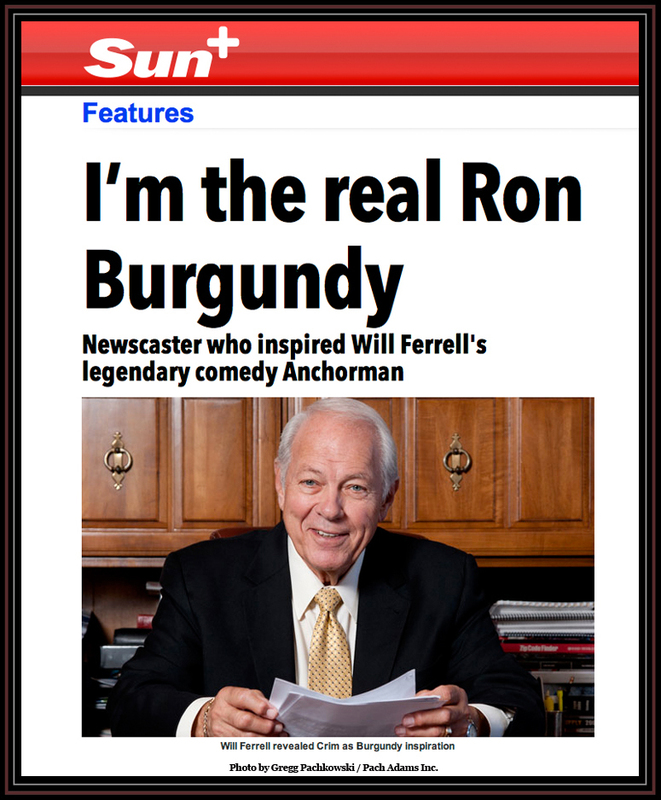 Along with the Hollywood buzz about the movie and its stars, there has been a renewed interest in the man who inspired the Ron Burgundy character. And that man is Mort Crim. Mort Crim is a former broadcast journalist who anchored newscasts in Detroit, Louisville, Philadelphia and Chicago. 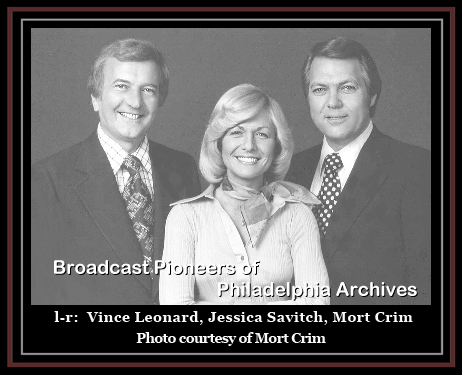 During this tenure in Philadelphia, KYW-TV made history when they added their first female anchor – Jessica Savitch – to their news team. At the time, Crim and his fellow male counterparts were not happy with the hire of Savitch. Of course, this was partly because the contemporary role of women at the station was mostly secretarial and caught them off guard. But more importantly, according to Crim, it was because she had very little experience and had not paid her dues. Of course this second part is completely overlooked when it comes to “Anchorman”. Apparently, it was the parts of the 1995 television movie “Almost Golden: The Jessica Savitch Story” during which Crim stated that he wasn’t nice to Jessica at first and that he himself was a “real male chauvinist” that caught Will Ferrell’s attention… and a movie was born. 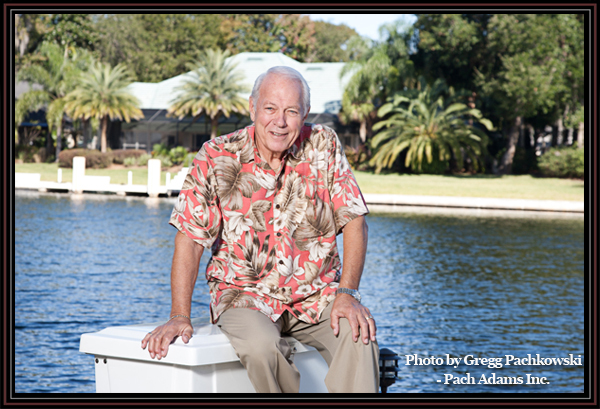 Well… This week, I was hired to photograph Mort Crim at his home in Jacksonville, FL to accompany one of dozens of stories that are being written in conjunction with the movie release. And I have to say, Mort was NOTHING like the Ron Burgundy character! Crim was one of the nicest, most polite, low-key, modest, humble people that I have ever met! The obituary of newspapers has already written as major newspapers like the Detroit Free Press are laying off dozens of staff members (including their entire photo department). However, surprisingly (or not so surprisingly) thousands of papers across the country are flourishing! You heard it! Unlike the once mighty, daily newspapers in big cities, small-town newspapers are still holding their own and in many cases are still lucrative. Of course, television news and newspapers have always tried to find a local angle on even the most remote major news story. During the war in Iraq, they featured local service people or their families. When Prince William and Kate Middleton got married, they featured local people who took the day off to watch on TV, if not someone who happened to be in England at the time. And so on. You get the picture. But this hyper-localism is much more than that. It is reporting on local news that directly affects its readers… and that is not covered anywhere else. The small-town newspaper fills this void left by national television news and online wire services. In fact, that is exactly what successful papers like the Ellensburg (WA) Daily Record are doing. 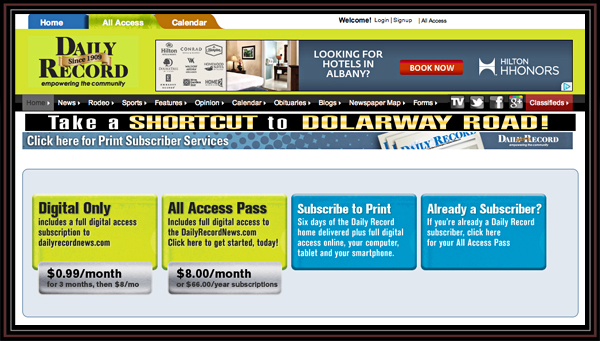 This 6,000 daily circulation publication offers limited “free” content and then requires readers to subscribe. According to Daily Record staff photojournalist Brian Myrick (a former colleague of mine from the Daytona Beach News Journal), not only is this model working very well for the Daily Record, but other newspapers in the area are quickly following suit. As Mark Twain once said, “The reports of my death are greatly exaggerated.” Well let’s hope the same is true about the newspaper industry! Angel and I recently took a trip up to Atlanta to visit some friends (including Valerie & Mike Bean) and to see some sights including the Georgia Aquarium (which was incredible) and the World of Coca Cola (Angel’s nirvana). 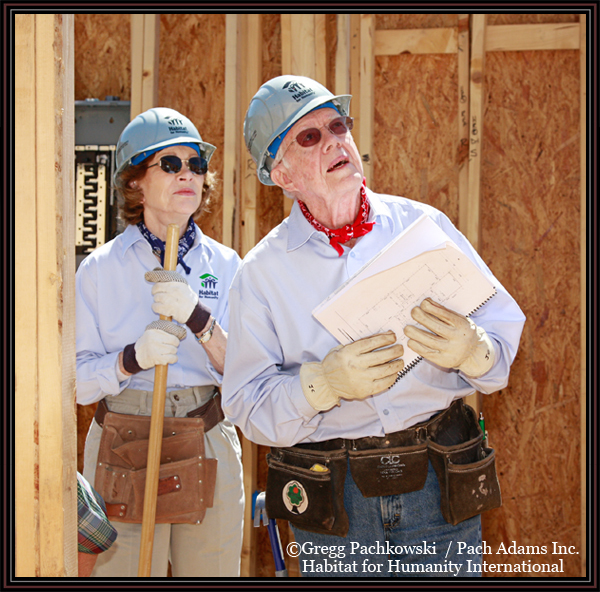 We know Valerie & Mike from many years of attending Habitat for Humanity International’s annual Jimmy & Rosalynn Carter Work Project. In fact, Valerie and I both attended our first Carter Work Project in 1999 which was held in the Philippines. Speaking of Jimmy Carter, the last stop on our Atlanta trip was the Jimmy Carter Library and Museum. Politics aside… Jimmy is probably the hardest working former President in the history of our country. 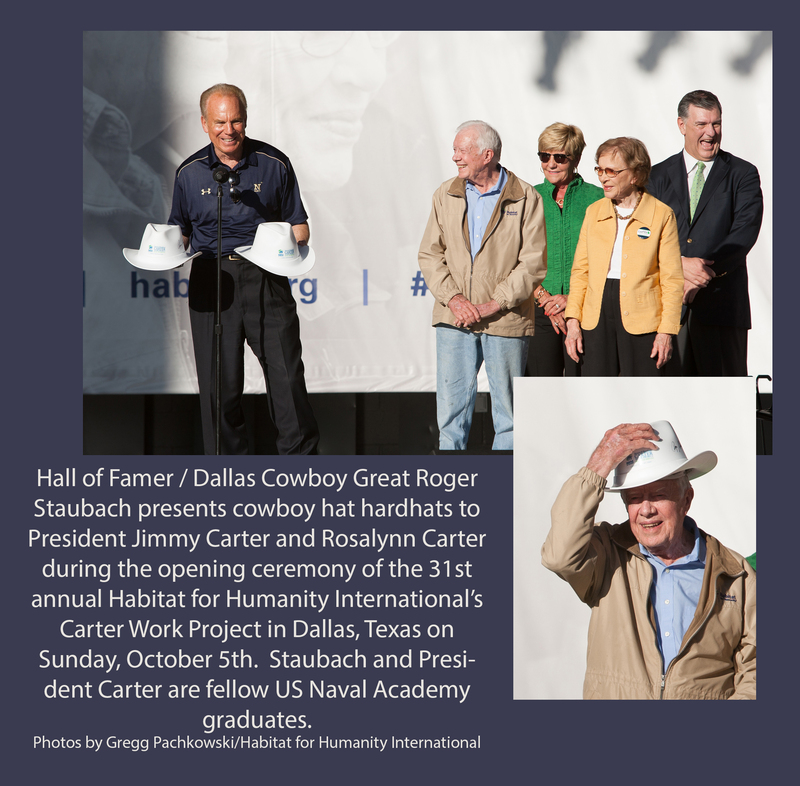 In addition to his work through the Carter Center, one of his favorite charities is Habitat for Humanity International which was founded by his good friends Linda and Millard Fuller in Americus, Georgia… just a stones throw away from their home in Plains. As a photojournalist, I have witnessed first hand politicians (of both parties) working posing for photo-ops. But not President Carter. Year after year, Jimmy and Rosalynn toil in the same dirt and heat as the hundreds of other volunteers to help build a house in one week during the annual project in their namesake. In fact, I believe that if it were up to President Carter, none of us photographers were be present; that way he could concentrate on the work at hand. But thankfully, the former President understands the importance of publicity for Habitat… so I get to keep my job. But I digress… Before entering the actual museum, visitors are shown a biographical film of President Carter… from his days growing up in rural Plains, Georgia… to attending the US Naval Academy… to ultimately becoming our 39th President and beyond. To my surprise, one of my photographs of the Carters building with Habitat in Pascagoula, Mississippi was shown during the video! I wasn’t positive that it was mine until I sat through a second screening and snapped a shot of the movie screen to check later. And sure enough. Once I got back to Gainesville, I checked my archives and confirmed that indeed it was mine! 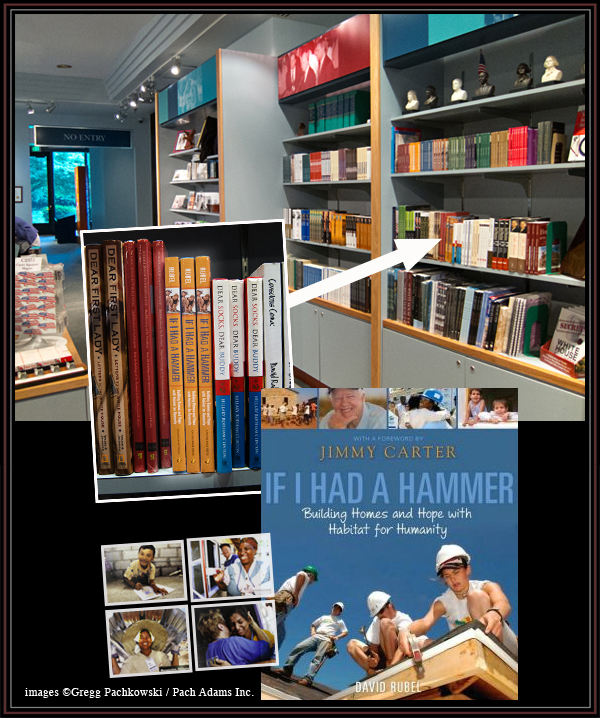 Then on our way out, I noticed that among the books for sale in the gift shop was “If I Had A Hammer” by David Rubel (and foreword by Jimmy Carter). This book which chronicles the history of Habitat for Humanity International also features several of my photographs. 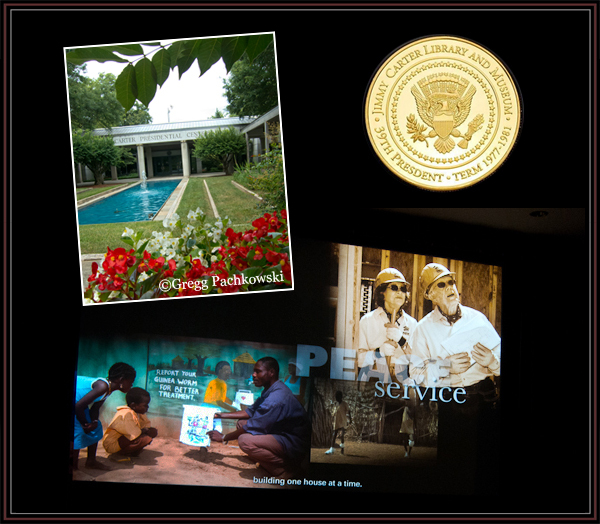 Needless to say, it was a thrill to see my work in a Presidential Library! This was a great end to a great trip! I will leave THAT up to the Professionals. 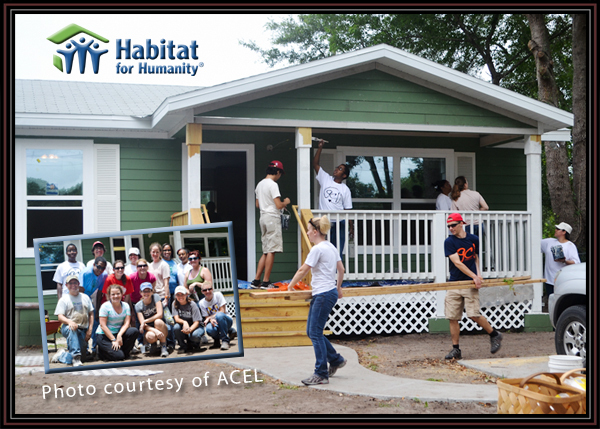 Recently, a group of us from ACEL (Alachua County Emerging Leaders) spent a day building with our local Habitat for Humanity. It felt good to get out there and play with some power tools… Arrrr Arrrr Arrrr Arrrrh!!! I think that Tim “The Tool Man” would agree. We all felt good about helping someone less fortunate in our community… AND we all actually had fun. Yes. Despite sweating in the hot sun and waking up sore the next morning, we loved it and had fun working. But, then again, unlike pro contractors, we don’t build everyday AND our livelihood isn’t on the line. I guess its like when you were a little kid… washing the car or cutting the grass was fun. But once you are expected to do such tasks as chores (or do them for a living)… not so much fun. Certainly, doing what you love is way better than doing what you hate. But when it comes down to making a living… work is… well… work. I love photography. And, yes, I love what I do. That said, things definitely changed when I started doing this as a living. Before the Daytona Beach News Journal hired me as a photojournalist, photography was solely for me… or my easily impressed family and friends. But now my audience is much more discerning and demanding. As with many things in life, both good and bad comes along with this profession. I have had many wonderful experiences as a professional photographer! I have been paid to travel around the world, I have met famous people like Garth Brooks and Pres. 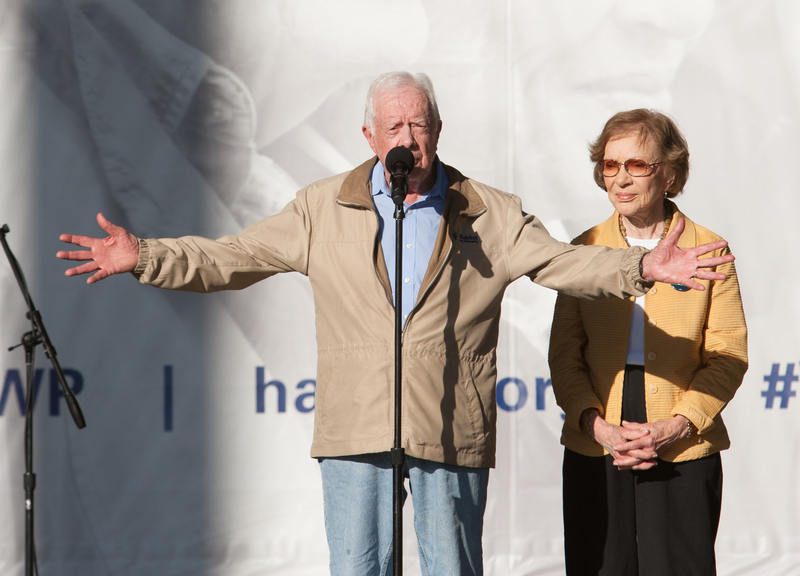 Jimmy Carter, I have photographed the Super Bowl… and the list goes on. Plus, I have learned that my images have the power to evoke emotions, tell stories, and, in some cases, change people’s lives. How great is that?!? However, with great power, comes great responsibility… OK… that’s a Spiderman quote… but professionalism does come with lots of responsibilities. Professionals have responsibilities not only to their clients, but also to their families (who depend on their income to keep a roof over their heads, food on their tables, to pay all of their bills). Professional photographers’ clients (or employers) expect consistency, high quality, creativity, and more… all under tight deadlines… with no excuses. We are expected to create dynamic images in all circumstances… Neither snow nor rain nor heat nor gloom of night… oh wait… that’s the post office. But then again, it might as well be our motto as well. It doesn’t matter whether it is a beautiful sunny day outside or inside the darkness of a cave… whether it is a boring, mundane assignment or a hectic, chaotic breaking news event, we are expected to get “the” image. It is more like fun AND work. Fun because we like what we are doing (& choose to do it). Work because we have responsibilities (& must always meet high expectations). After building for a day (and proverbially walking a mile in the shoes of professional contractors), I have an even greater respect for their knowledge, talent and skills. Posted in Uncategorized	| Comments Off on I will leave THAT up to the Professionals. Needless to say, this comment set off a fire storm in the professional photography community! So, yes, professional photographers have taken offense. Many of us have spent years studying, practicing, and honing our skills in an on-going process. Unfortunately, not everyone is visually literate. Those people who are can see the undeniable difference between good and bad images (objective qualities like exposure and sharpness) and they appreciate the skill it takes to achieve professional images on a consistent basis. I would no sooner call myself a professional basketball player because I own a “professional” official NBA basketball and can make an occasional 3-point shot. Nor would I call myself a chef because I own “professional” Calphlon cookware and can make an occasional gourmet dinner. The problem is that too many people with a “professional” camera think that they are professional. Take enough snapshots, eventually you will get a good one. Get a handful of good ones… add “Photography” to your last name… post them to a website… and voila, you are a professional! Correct? NO! Unfortunately, Ms Mayer’s statement plays right into this theory. Shoot lots and lots of photographs… post them to the same place as professionals (in this case Flickr)… and suddenly everyone doing photography is equal. That is absurd. 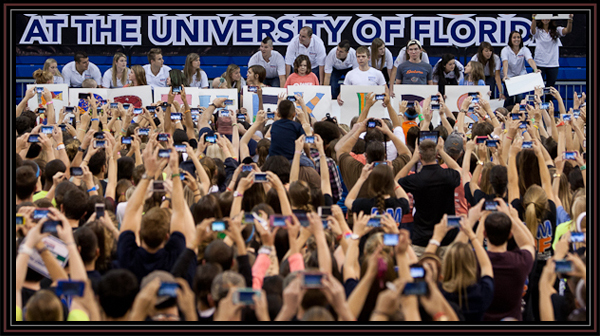 Like making a 3-point shot, anyone can take a great photo. But can they do it every time and on-demand? Can they do it under pressure and in any conditions? In addition to shooting skills, part of the art of professional photography is the ability to edit (and I mean cull) your work with the objective of only choosing the best of the best. According to veteran photo editors, “Knowing what not to show is as important as to what to show.” This is a point that is too often missed. And if you ever sat through tray full after tray full of your neighbor’s vacation slides you would know what I mean. With the public’s conception of professional versus non-professional photography blurring… and the onslaught of mediocre images flooding the internet which are becoming accepted as the norm (and “good enough”)… the comments of people like Yahoo CEO Marissa Mayer bolstering this idea… the ability to actually make photography one’s “profession” has become harder than ever. But what made this commercial stand out? Well… instead of using the surefire marketing trifecta (of babes, beasts or babies), humor, or overwhelming special effects, this commercial featured a simple slideshow of amazing still photographs set to a poem read by the late Paul Harvey. The images were not snapshots. They were not made by the “billions of roaming photojournalists with iPhones” touted in a recent television commercial. No… ten noteworthy professional photographers… including National Geographic’s William Albert Allard and documentary photographer Kurt Markus… were commissioned to capture these stunning images. IMHO…the impact of this commercial demonstrates that the still image continues to wield power and relevancy. And on the 9th day God looked down on his planned paradise and said, “I need someone to capture images of wonderful things and tragic things.” So, God made a professional photographer. God said I need somebody to get up before dawn and capture that golden light and work all day in the elements (scorching sun, rain, and even snow), download files, edit and then edit again down to the best of the best, tone, deliver, and then archive those images working well into the night. So, God made a professional photographer. I need somebody with strong back. Strong enough to carry multiple cameras, lenses, and lighting gear, yet gentle enough to put subjects at ease… everyone from little children to time strapped executives. Somebody to deal with demanding clients, small budgets, and ever increasing costs of new equipment, new computers, and new software… and telling them no problem… and mean it. So, God made a professional photographer. God said, “I need somebody that can shape light, use a hot shoe or off-camera flash… make a light modifier out of cinefoil, scrap paper and gaffers tape. And… who, at busy season, will finish his forty-hour week by Wednesday evening. Then, pain’n from carrying all of that heavy pro gear, put in another forty hours. So, God made a professional photographer. God had to have somebody willing to ride to the middle of nowhere at a moments notice to photograph and get the assignment in ahead of the deadline and yet somehow have time to blog, answer emails, and continue marketing. So, God made a professional photographer. It had to be somebody who’d photograph properly-exposed and in-focus pictures with story-telling ability using available light (that is… any light that is available, with some needing to be plugged in)… and not cut corners. Someone to conceptualize and analyze, compose and expose… to bounce and fill and modify and control the light and know how to read a histogram. Somebody to burn a CD and then finish a hard days work with a five-mile drive to the nearest FedEx. Somebody who’d try to spend time with his family, who’d laugh and then sigh… and then respond with tired eyes, when he tells his son spend his life “doing something other than what dad does.” So, God made a professional photographer.